This RF modulator will converter RCA audio/video or S-Video to F-Pin cable coax. 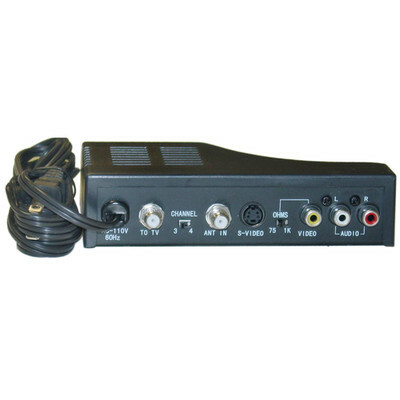 This is great for older TVs that do not have an a S-Video or RCA inputs, but only have the cable-TV style connector. The one I got doesn't match the picture exactly on the site; it had the same back panel with a rectangular case. The composite inputs on the back are very poorly constructed and bend inwards when connecting cables. There are also noise interference issues that I could not resolve - making movie watching impossible with the loud static that would ...modulate...over and over again when the DVD player was merely turned on. After very sparse use, the video was cutting out. I opened up the case to find that the RCA jacks are soldered directly to the board without any real support, and the solder lifted and tore traces clear off the PCB. There was no rewarding way to solve this other than throwing it in the recycle bin. I later purchased an RCA four-input video/audio switch and modulator that is a beast, and works perfectly in the same setup with none of the issues. It wasn't even much more expensive but clearly RCA cared about quality, whereas the makers of the RF modulator on this page were skimping on materials and effort. CableWholesale Response: Thank you for this great in depth review. We checked our stock and have removed all of the offending parts from our offerings. This part going forward now matches the pictures and is of higher quality. We will contact you directly about a refund. Stereo audio input would suggest stereo audio modulation but unit sums audio to mono for the modulated signal. Would not have purchased it had I known. The product is great easy to use. Seems to have noise Issues. This product seems to have noise Issues. Works exactly as expected. Automatically switches between DVD & video source (Sat/Cable/Antenna). A must if you're using an older TV with a single RF input! Product performs exactly as specified.